Sound performance is man’s innovation, primarily to boost sound to provide artistic beauty to music, movies or live performance or any other media. Sounds emanating from this electronic gadget can be electrifying and sensational. This creation called subwoofers is what allows us to now only hear the music, but feel it as well. Subwoofers can power even the largest of venues. Although, most of are just looking for an in-home subwoofer such as the Polk Audio PSW10. How Is Polk PSW10 Subwoofer's Performance? But what about smaller settings, such as a house, or even just a living room? Subwoofers are great for smaller settings as well. Almost every home has some kind of subwoofer, whether it's a part of your surround sound stereo, or even in the trunk of a car parked in the garage. We listen to music, watch movies, live performances and other motion pictures, and we may not even realize it, but the bass is what brings sound alive. If you want to enhance the sound performance in your home, then Polk Audio PSW10 subwoofer is the best solution. This subwoofer product is one of the best subwoofer brand recommended for any room. 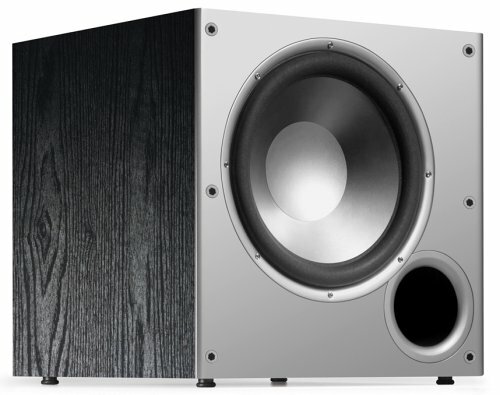 The Polk PSW10 is a 10-inch driver and well-polished box subwoofer that is suitable for small to medium size rooms. The Polk PSW10 subwoofer is available in two colors namely, black and cherry colored vinyl and it is manufactured by Polk Audio, Inc.
Polk Audio, Inc has been around since 1972 and with a good pedigree for recreating and customizing sound through its innovations and technology. Polk Audio, Inc is one of the best manufacturers of quality audio sound effects devices at a very affordable price. When viewing a set of films on Blu-ray the PSW10 provided deep bass. We expected the PSW10 not to deliver due to its small size, but we were wrong. Its bass output was detailed and clear without being overpowering. For audio playback, the PSW10 was skillful. It proved to be accurate and nimble and provided a great low-end for any genre of music. The Polk PSW10 is ideal for small to medium size rooms. In a large space, the PSW10 might struggle to provide adequate bass. For a bigger room, you may want to consider the Polk PSW505. The Polk PSW10 has a lot to like. For, small or medium size chambers it provides exceptional value for anybody who would like to update their home Theater's sound quality. But it may struggle to provide sufficient Bass in large rooms. The Polk Audio subwoofer can be connected to a variety of electronic devices. Using the recommended RCA cable you connect to both input of the Polk Audio subwoofer, or you can make use of a single subwoofer output cable on either input as either way, it will work perfectly well at whatever volume it is adjusted to. The next thing you want to do is adjust the variable low-pass filter to the highest frequency possible. It is important to adjust to the highest so the internal low-pass filter will be above the low pass frequency your receiver gives. While this set up is done, it is likely that you will experience port noise on the subwoofer. This noise happens to be inaudible if the volume of the subwoofer is low that the receiver the noise becomes inaudible if it is higher than the higher than the receiver, an audible noise is produced. To overcome these challenges, ensure the output volume of the subwoofer and volume of the receiver is matched. Polk Audio subwoofer has a high performance, and even with a frequency as low as 35Hertz, its bass belabors so well such that you appreciate every sound it makes. The subwoofer provides a quality, yet reasonable low-end. You get to hear the bass with clarity without stressing your ears. Its sound quality is unique, and it is felt at every corner of the room. This item sells for around $100. We picked three similar subwoofers available on the market to see how they compare with the Polk PSW10. The Polk Audio PSW10 subwoofer comes with a smart sensing circuitry that automatically turns this device off when it there is power outage or fluctuation. This auto features help to avert any damage that could be caused due to a power surge. It also automatically turns on when power is restored or stabilized. The safety of your Polk Audio PSW10 subwoofer is guaranteed whenever these unanticipated incidents occur. When it comes to quality of sound, the Polk Audio PSW10 subwoofer has got what it takes. The PSW10 has a terrific sound even at low volumes (and frequency). The Polk Audio PSW10 subwoofer comes with an integrated 50 Watt RMS amplifier. A 50-watt RMS amplifier utilizes high power voltage; however, this does not call for concern for wattage because as part of the PSW10 subwoofer's design, the challenge of high power voltage is addressed. The Polk PSW10 subwoofer can work perfectly with other quality speakers that just don't provide the low-end you're looking for. Polk series speaker such as TSi, RM, and R/T/M speakers are compatible as well. The Polk PSW10 subwoofer has a stable sound irrespective of whether the volume is low or high and also the sound performance at low power voltage. You can comfortably adjust the volume of your system as desired without worrying about the effect of the sound performance. The Polk PSW10 subwoofer offers multiple connection options such as stereo speakers and RCA line input. It, unfortunately, does not have a direct LFE connection point like the Polk Audio PSW505. This subwoofer has a high performance, and even with a frequency such as 35Hertz, continues to deliver. You get to hear everything clearly without stressing your ear on every sound produced and its sound quality is unique and felt at every corner of the room. Polk Audio Inc brings innovative sound technology into PSW10 has a guaranteed of durability over other Audio subwoofer products. It only works with devices that are compatible with Polk Audio speakers. It has no magnetic shielding. It is best advised to keep some meters away from the LCD TV or some other position for optimal performance. We gave the sound quality a 4.5 out of 5 stars. 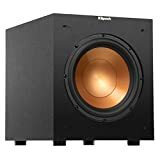 The Klipsch Reference R-10SW is a black colored, passive, bass reflex 5.1 surround system or 5.1 on the Richters releasing a deep and thunderous bass. It is a 10 inch, front firing driver, Copper Injection Molded Graphite cones provides a credible sound performance. Copper Injection Molded Graphite is very light and stiff enough to hold to withstand pressure and decimate sound fluctuations and distortion at the very minimum. The bass produced by the drivers are deep and with flexible placement. This device comes with an all-digital inbuilt amplifier for high efficiency and power. Klipsch Reference R-10SW can deliver an output of up to 300 watts dynamic power dishing out the “boom boom” sound with less effect. It has a frequency range of 32 to 120 Hz. Its low-frequency response is superb and with clarity. Also, it also has a low pass crossover frequency and phase control. Behind the woofer is a line/LFE input that is compatible with both old and modern receivers. The cover material is made of Medium Density Fiberboard (MDF) with brush polymer veneer finish. Poor build quality and cannot be used as part of a decorative piece. This item sells for around $180-$210. Yamaha’s 8 inch YST-SW215PN system is an advanced YST II technology with high quality, active, bass reflex, front-firing subwoofer with great power and low noise or distortion performance. The enclosure material is made of Medium Density Fiberboard. The 10-inch long stroke cone comes with magnetic shielding. At a low frequency, the YST-SW215PN's floor stands speakers to aid in bringing out an enriched sound with clarity in audio because of it YST II technology. YST-SW215PN comes with an inbuilt amplifier of 100 Watts is thundering and powerful, and it delivers a frequency response range of 25 to 180 Hz. A unique feature is come with is the input level control and the cut filter varies between a high and low range. It has a linear port that aid in decimating noise and distortions. YST-SW215PN connectors come with a set of spring terminal and stereo RCA inputs each and a set of spring terminal output. The Polk Audio PSW10 is more than an experience. It re-evaluates the word "budget" in terms of the appreciation of music and sound. For the price, this is simply a great quality subwoofer. Its design is simple and excellent. The Polk PSW10 subwoofer has no LFE, but it can be bypassed with a very good receiver. Therefore, it would be the best and honest review to rate this subwoofer, the Po​​lk Audio PSW10, at 4.7 stars. The Polk Audio PSW10 subwoofer is considered to be a great investment because it offers excellent performance and clear sound. It also has a smart sensing technology that automated signals for power off and no. However, it may not be adequate for large rooms and it only works with Polk speakers.